PLACE NAMES AND THEIR MEANINGS are fascinating, transporting us back in time, and shedding a new light on familiar locations. But an explanation of the origin of all those -ton's, -don's, ham's, -holme's, -hulme's, lea's, -ford's, -bury's, dale's. -port's and of course -chester's isn't an exact science. In the case of many places names, we don't know at all where they come from, or there are several possible alternatives. This can be frustrating, but adds to the mystery. Let's go on a quick etymological tour and see how natural features, people and other influences have left their mark on the place names around us. A majority of place names contain just a handful of elements from Old English, one of the most common being '-ton', which has come to mean 'town' but has its origins in an older word '-tún' meaning farm, settlement or homestead. Thus Newton is the 'new homestead', Flixton is the 'tún' or homestead of a man called Flic.., 'léah' is an Old English word meaning 'wood, clearing or meadow' and is seen in Leigh, 'the place at the clearing'. Burh is 'fortification', standing alone in modern Bury and as an ending in many other English place names. 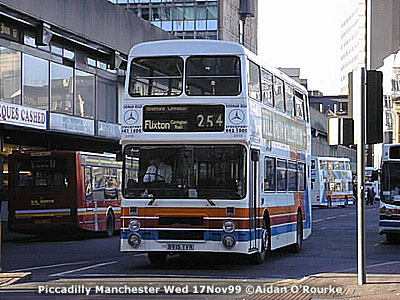 Hulme comes from Old Saxon 'holmr' 'island' or 'raised land in marsh', Hulme just south of the city centre being an 'island' bounded by the rivers Medlock, Cornbrook and Irwell. The ending '-don' often comes from old English 'dun', meaning 'hill' or 'down', so Bowdon is 'boga-dun' or 'rounded hill'. Nearby Dunham is 'homestead by the hill'. 'Dún' is also a word for hill in Irish and Scottish Gaelic. This reminds us that since the dawn of civilisation, our local area has been a place of migration and settlement by people of different tribes and nationalities, a process which continues today. River names have ancient origins, and many derive from Celtic words for water, like the Ouse, Exe or Avon. But the most famous local river has a Germanic origin: Mersey literally means 'boundary river', dividing the ancient kingdoms of Mercia (a Latin name itself meaning boundary) and Northumbria (kingdom north of the river Humber), and later the counties of Lancashire and Cheshire. An even more German-sounding river name is the Irwell, almost the same as modern German, 'irre' 'crazy', here 'meandering' and 'Welle', meaning 'wave' or here 'river'. The 'Ir-' in Irk also has the same origin, with a diminutive k - like the -ka on Polish and Russian personal names - giving an meaning of 'angry little stream'. 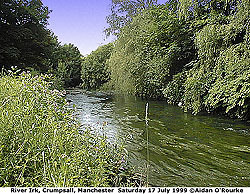 The Croal is the 'winding stream' or 'croh-wella' and the Medlock is the river that flows through meadows. The Tame is of Celtic origin, similar to the Thames and the Tamar, and means 'dark one' or simply 'river'. There may be a connection to similar sounding words in Old Irish and Sanskrit. Areas next to rivers give us further place names, such as Strangeways - 'strang + waesce' or 'place subject to strong flooding' - this was true up to the 1950's when an elbow of the Irwell was smoothed out and the banks strengthened. Reddish is the 'ditch where reeds grow'. Water cress grows near water, so Kearsley is the 'léah' or clearing of watercress and Kersal, the 'halh' or nook or tongue of land between two streams, where the watercress grows. As we've seen, ancient boundaries have left their mark in place names, and the Mer- in Mersey is also found in the Mar- in Marple, Old English 'maere-pyll' our 'boundary creek', meaning the River Goyt, here dividing Cheshire from Derbyshire. Another, slightly less well defined border which figures mysteriously in several local place names is Lyme or Lyne. Lyme Park and Ashton-Under-Lyne are close to Manchester, but Newcastle-Under-Lyme, Audlem and Burslem are further south, so what's the connection? Lyme means elm tree and by association 'forest', here the forest of Lancashire, so Ashton-Under-Lyne is a translation of Latin 'infra limam' - 'under the lyme' or inside the forest or boundary of Lancashire. The place names further south also refer to Lyme but the connection is less clear. Another interpretation doesn't mention the 'boundary' connection, saying Lyme means simply 'of or near the elm trees'. Trees figure in many place names, including of course Ashton, the town or 'tún' (homestead or farm) of the Ash trees - also the origin of the Ashton on Mersey and Ashton in Makerfield. Another tree is gives us Werneth - 'the place where the alders grow', and Audenshaw is 'Aldwine's copse'. Openshaw is an 'unenclosed wood', Collyhurst is a 'charcoal copse', Horwich, 'the place of the grey wych-elms', both Winton and Withington are 'among the willow trees' and Grimshaw - a town in Lancashire and a lane in Bradford (Manchester): 'wood where the spectre lurks'. The Chead- in Cheadle is the same as the coed, in Betws-y-Coed ('prayer-house in the wood') in north Wales, so Cheadle comes from a Celtic word meaning wood, an appropriate name for this still leafy and wooded district. But the Celts were driven west into Wales and the Anglo Saxons settled this area, and appended their word for wood or clearing 'léah' onto 'ched', giving 'Chedlee', which became Cheadle - also a place name in Staffordshire. It's fourteen centuries or so since the Welsh or Celtic tribes moved west into the hills, but they've left their mark in place names such as Pendlebury 'manor by the (hill called) Pen'- same as the 'pen' in Penmaenmawr 'great (mawr) stony (maen) headland (pen)' on the north Wales coast. Again an Anglo-Saxon suffix -le has been added, confusingly similar to the -le in Cheadle, but a different word, meaning hill. So Pendle means 'hill hill' and in the case of Pendle Hill, we've added our modern word to the two older ones, so it means literally 'hill hill hill'. Another place name said to be of Welsh origin is Wigan, originally 'tref Wigan' or 'village of a person called Wigan', though there are other competing explanations. The Welsh word for chair is cadeir, and we see it in Chadderton, the 'tún' or town on the chair, here again meaning 'hill'. Other hills are Winter Hill, the hill used in winter, Hartshead Pike, or 'pointed hill', named after the hart or stag, and Oldham, 'holmr' or promontory. The 'old' is the same as the modern meaning according to one source, but another says it's 'alt' 'high'. Mobberley, in Cheshire is 'gemot beorg léah' 'glade with an assembly mound'. Saddleworth is named after a hill shaped like a saddle. 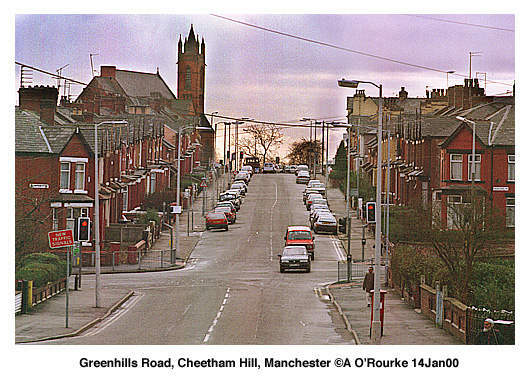 I didn't come across the origin of Cheetham Hill, can anyone help? Farms, agriculture, animals and features of the land are the origin of many places which are now built up areas. Fallowfield is the place of the newly-ploughed field, Harpurhey is 'Harpour's enclosure', Farnworth is a fern enclosure. Whitefield is the dry, open pasture, Swinton is the 'tún' where the swine or pigs are kept, and Mottram (both in Longdendale and near Prestbury) may be 'moch tref' or pigs town. Hindley is the wood where the hinds are, Chorlton is the 'tún' or farm of the 'ceorl's' or peasants - cognate with 'churl' or 'churlish'. 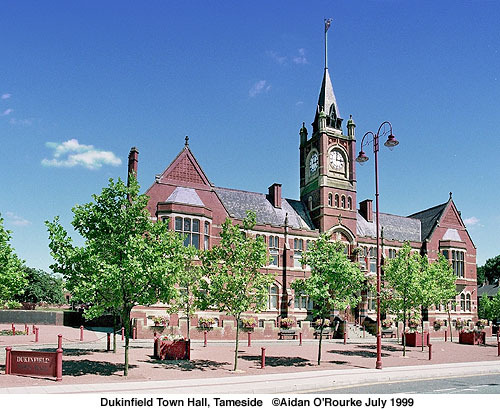 Dukinfield is... yes, you guessed it, open land where the ducks are. As we've seen, individuals have given their names to many places, such as Wighelm whose 'hlaw' or mound gives us Wilmslow. Nearby Alderley Edge is the 'léah' i.e. woodland or clearing of a woman called Althryth. Edge is a modern addition referring to the nearby sandstone escarpment which 250 years ago was treeless. Harpour and his 'hey' or enclosure have already been mentioned, but who was Dyddi, whose 'burh' or fortified place was built near the Mersey, close to the village we now know as Didsbury? Tyldesley is Tilwald's 'léah', Urmston comes from a Danish personal name, Walkden is the 'valley of Wealaca' and Worsley is Weorcgyth's 'léah'. Knutsford is said to be 'Knútr's ford', though it's also been associated with King Canute or cnut. Altrincham is the 'homestead of Aldhere's people', (inga = people), I'm not sure about Besses o' the' Barn - can anyone help me here? 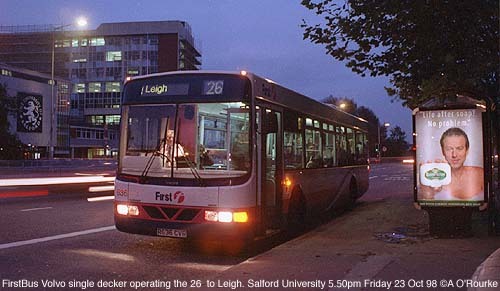 Levenshulme is 'Leofwine's holmr' or raised ground. It's spelt 'Levensholme' on the 1840 map.